The integrity of a piping system depends on the considerations and principles used in design, construction and maintenance of the system. Piping systems are made of many components as pipes, flanges, supports, gaskets, bolts, valves, strainers, flexibles and expansion joints. The components can be made in a variety of materials, in different types and sizes and may be manufactured to common national standards or according a manufacturers proprietary item. 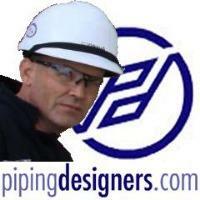 Some companies even publish their own internal piping standards based upon national and industry sector standards. Piping codes and standards from standardization organizations as ANSI, ASME, ISO, DIN and others, are the most common used in pipes and piping systems specifications. Piping standards define application design and construction rules and requirements for piping components as flanges, elbows, tees, valves etc. A standard has a limited scope defined by the standard. Piping codes define the requirements of engineering, design, fabrication, use of materials, tests and inspection of pipes and piping systems. Each code has a limited jurisdiction defined by the scope of the code. This Code contains requirements for the materials, design, fabrication, assembly, erection, test and inspection of refrigerant, heat transfer components & secondary coolant piping for temperatures as low as -320°F (-196°C). This Code contains information on the design, fabrication, installation, inspection, testing, and safety aspects of operation and maintenance of pipeline facilities used for the transportation of hydrocarbon gases. This Code contains information on the design, fabrication, installation, inspection, testing, and safety aspects of operation and maintenance of piping and pipeline facilities used for the transportation of Hydrogen gas. (1) This Code covered the design, fabrication, installation, and testing of piping systems for fuel gases such as natural gas, manufactured gas, liquefied petroleum gas (LPG)-air mixtures above the upper combustible limit, liquefied petroleum gas (LPG) in the gaseous phase, or mixtures of these gases. Included within the scope of this Code is fuel gas piping systems both in buildings and between buildings, from the outlet of the consumer's meter set assembly (or point of delivery) to and including the first pressure containing valve upstream of the gas utilization device.